The Wideband FAILSAFE Gauge provides the ability to accurately tune AFR, while actively protecting your engine by constantly monitoring AFR curves and activating a user-defined failsafe strategy if it runs lean. The Wideband FAILSAFE Gauge is a Universal Exhaust Gas Oxygen (UEGO you-way-go) controller with an internal boost sensor, an internal data logger and a full color Organic Light Emitting Diode (OLED) display. It includes technology to activate a failsafe strategy in the event AFR falls outside of a user-defined operating window. If the AFR falls outside of the set operating window, the Wideband FAILSAFE Gauge triggers a user defined output function that can save an engine from catastrophic damage. WHY YOU WANT ONE This product is a must have for all tuned performance engines, either forced induction or naturally aspirated, fuel injected or carbureted. 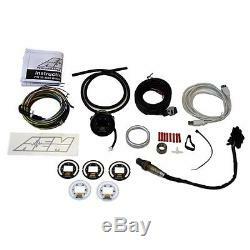 Any high performance vehicle owners who want a highly accurate AFR tuning tool with logging and a protection strategy that can save an engine from catastrophic failure will want this FAILSAFE device. WHAT IT DOES After the engine is tuned and a safe operating window of AFR is established, the Wideband FAILSAFE Gauge continually monitors AFR and boost or vacuum to make sure that AFR does not fall out of the defined operating window at a given boost or vacuum level. If the Wideband Failsafe detects an out of range AFR reading, the gauge triggers a low side output (ground signal with a 1.5 amp draw max) that can save your engine from catastrophic damage. Use the gauges intuitive software to configure the low side output, create a user-adjustable time delay strategy to prevent false alarms, and customize the gauge lighting to flash and alert the driver if an alarm is triggered. EXAMPLE ENGINE PROTECTION STRATEGIES NATURALLY ASPIRATED, TURBOCHARGED OR SUPERCHARGED WITH STAND ALONE EMS OR PIGGYBACK CONTROLLER: Use the low side output to cut revs, retard timing, trigger a separate fuel or ignition map and activate an ancillary warning light. Users with turbos can also trigger the device to cut boost (may require separate solenoid). The aforementioned strategies are provided as an example. Available failsafe strategies will ultimately be dependent on the capability of the EMS or piggyback engine controller. ON-BOARD DATA LOGGER The system contains an on-board data logger for logging over three hours of data recording (20 Hz per parameter) of AFR, RPM, boost, alarm, and others. Data logs can be downloaded for viewing in the new AEMdata software. WHAT IT INCLUDES The 52mm (2-1/16) Wideband FAILSAFE Gauge includes a Bosch 4.2LSU AFR wideband sensor for monitoring and feedback of AFR and an on-board boost sensor to read vacuum or boost pressures up to 29 PSIG. Both boost and AFR can be displayed in real time on the gauges face using the full color OLED screen and 24 three-color sweeping LEDs. The gauge includes a low side output for triggering a failsafe strategy in the event AFR falls outside of the operating window (example strategies below), and an RPM input to log RPM for tuning purposes. Once installed, users connect to the gauge via a USB port and use the supplied software to log an engines safe AFR operating range, set minimum and maximum AFR ranges, alarm mode, time delay strategy, failsafe strategy and gauge display configuration. Non AEMnet devices can communicate with the device using the CAN 2.0B spec protocol. An analog output for O2 feedback is provided for users without AEMnet or CAN-equipped devices to hard wire the gauge for O2 feedback or logging in a stand-alone logger. WHY USE A WIDEBAND AIR/FUEL CONTROLLER? 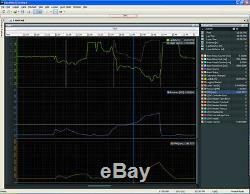 Accurate AFR data is critical when tuning an engine. Running rich (very low air/fuel ratio, excessive fuel) can cause a loss in power and fuel economy, while running too lean (very high air/fuel ratio, not enough fuel) may result in serious engine damage. Using a wideband air/fuel controller during the tuning process allows you to monitor AFR and adjust tuning parameters to optimize them for maximum power and efficiency. 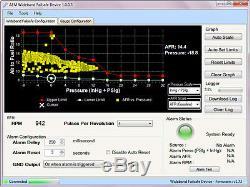 The Wideband FAILSAFE Gauge is an ideal engine tuning tool. The highly accurate Bosch AFR wideband sensor is maintenance free and never requires free-air calibration, enabling you to fine tune AFR from an AEM programmable engine management system, any other programmable EMS or piggyback programmer. For carbureted applications, it can tell you when its time to swap carb(s), change jets or simply modify fuel pressure. WIDEBAND FAILSAFE GAUGE FACEPLATE STYLES. Kit comes with 6 different faceplates and black and silver bezels. Black and White AFR in sweeping LEDs. Black and White Vacuum/Boost in sweeping LEDs. Black Vacuum only in sweeping LEDs. Black Lambda in sweeping LEDs. WIDEBAND FAILSAFE GAUGE TECHNICAL FEATURES. Displays both boost or vacuum and AFR or Lambda simultaneously on the same gauge. No free air calibration required ever. Bosch Wideband UEGO sensor and weld-in bung included. On-Board 3+ hour Datalogging capability at 20hz per parameter. Full color Organic Light Emitting Diode (OLED) Display in center, user selectable feature (boost/vacuum or AFR). 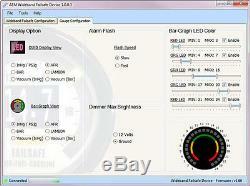 24 three-color sweeping LEDs, user selectable feature (boost/vacuum or AFR). Interchangeable faceplates and bezels (see options, above). Data analysis using AEMdata software. WIDEBAND FAILSAFE GAUGE INSTALLATION FEATURES. AEMnet compatible (CAN 2.0). Configurable RPM input for logging. One low-side driver output (Ground with 1.5 amp max draw). Tunable PC-based software with USB connectivity. Time based reset for output. Images are for abstract illustration purposes and in most cases do not represent the actual product. Our product listings typically contain part numbers. These part numbers correlate with the product you will receive. We do this to keep costs low for the customer. Territories Outside the 48 States. We process international orders every day. The most expensive rate is for. The item "AEM DIGITAL WIDEBAND UEGO FAILSAFE AIR/FUEL & BOOST GAUGE ALL-IN-ONE FAIL SAFE" is in sale since Thursday, July 24, 2014. This item is in the category "eBay Motors\Parts & Accessories\Car & Truck Parts\Air Intake & Fuel Delivery\Other". The seller is "streetrays" and is located in Pflugerville, Texas. This item can be shipped to United States.